You people (yeah I said You People) are really getting out of control with these Beyonce, Blue Ivy conspiracy theories. Ya'll even got church folks buying into the madness. 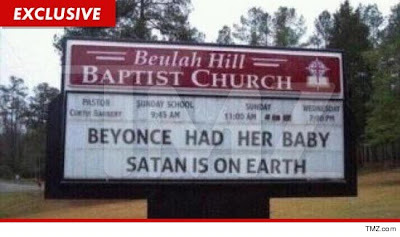 Beyonce's new baby Blue Ivy Carter is the devil incarnate -- this according to some heartless vandal who defaced the sign in front of a North Carolina church yesterday ... writing, "Beyonce had her baby. Satan is on Earth." The pastor at Beulah Hill Baptist Church in West End, NC tells TMZ, he discovered the vandalism yesterday after receiving numerous complaints from locals -- and removed it immediately. The pastor insists, the church had nothing to do with the apocalyptic message ... it was simply the victim in a random act of mischief. Now you know I have to give the pastor the side-eye on this one. You really expect us to believe that a vandal came in and wrote something like that on the church sign. Really, Pastor! Really! I'm thinking you may want to go back to the drawing board with that one and rethink your answer. Just say something like you saw how fascinated people have become with the birth of Beyonce's baby (because you know she's the only woman on earth to have ever given birth) and you needed a way to get publicity for your church so you decided to jump on the Beyonce's-baby-is-apart-of-the-Illuminati bandwagon. Just say that. We'll completely understand that over that lie you just feed us about vandals doing it. I'm going to have to hit you with the Child Please on this one. Yea, I'm giving him the side eye too. that's the cleanest vandalism job i've ever seen. good work, vandals!